Earlier this year, I had the opportunity to preview Heather Crosby’s new book, Yum Universe, while it was in the final stages of production. Yum Universe is a guidebook to living a gluten-free, plant-based, vibrant whole food life, and includes oodles of healthy recipes, photographs, and tips to get you started. Many of you may know Heather’s inspiring blog by the same name and if you’ve read for any length of time, you know how passionate she is about a plant-based lifestyle. A former veggie-phobe, she now loves to encourage others to make positive changes in their own diets. I’ve especially enjoyed her YU Should Know series where she interviews other plant-based enthusiasts about how they’ve made the shift (you might remember my interview with her in the spring!). 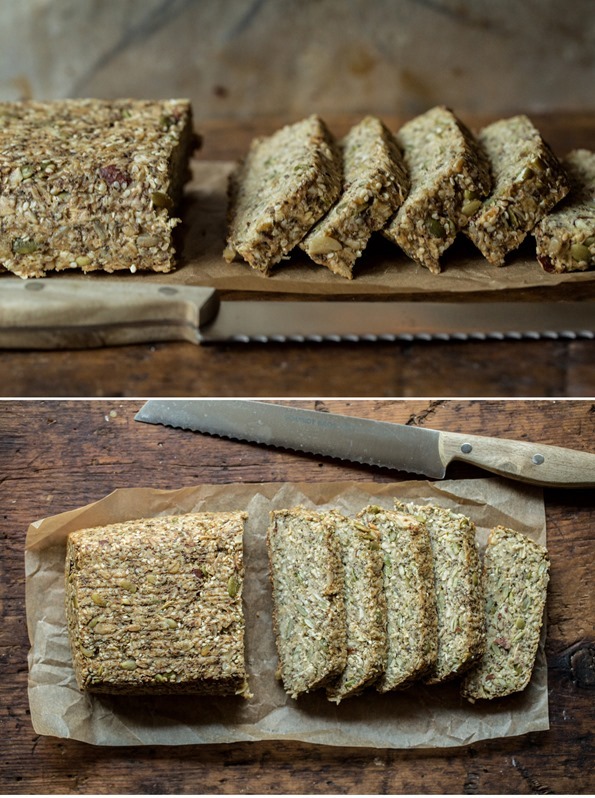 Today, I’m sharing one of my favourite recipes from Yum Universe – Heather’s Toasted Super Seed Power Bread. It’s a recipe I’ve made a dozen times now and it never lasts longer than a few days in this house. It’s loaded with chia seeds, pepita seeds, almonds, sunflower seeds, sesame seeds, hemp seeds (my addition), and the only flour you’ll find in this bread is high-protein chickpea flour. I expect you could easily make this nut-free by swapping out the almonds for another seed. My brother in law likes to call this “bird seed bread” which I can’t really argue with. I love me some bird seed!! Think: Mary’s Crackers meets bread. It reminds me of Sarah’s Life Changing Loaf of Bread, which I’ve made in the past and also loved. I’m all about this trend of bread moving from nutrient-void to nutrient-packed. Bring it on. Speaking of nutrient-packed, each small slice boasts 6.1 grams of protein and 4.6 grams of fibre (I calculated the nutritional info in the recipe notes below, just for curiosity). It’s also loaded with healthy fats. If you enjoy a hearty slice of crunchy, chewy bread this recipe is for you. Some people I served this to were expecting a traditional fluffy bread, so just be warned that it doesn’t produce the traditional bread we grew up with. It won’t be for everyone, but hey…more for us, right? I really think you have to try it at least once! To be honest, I would take a slice of this bread over the regular stuff any day. Bird seed for life. Try it toasted with a pat of coconut oil on top. Minds will be blown. Stomachs will do happy dances. I couldn’t help but play around with the recipe a tiny bit, so I’ll let you know my modifications in the headnote. Let us know what you think of it if you do try it out! Thanks Heather for letting me share your recipe today. Be sure to check out her book – Yum Universe – in bookstores now! 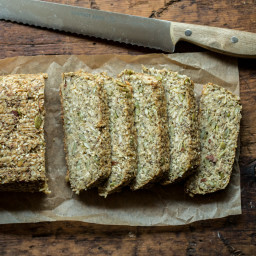 A hearty, crunchy, chewy, high-protein and fibre bread free of gluten! What's not to love? This recipe is lightly adapted from Heather Crosby's Yum Universe cookbook (2014). Some of the changes I made to this recipe are the following: Instead of letting the dough sit overnight, I was impatient (nothing new here!) and only let it sit for an hour. To my delight, it still worked out lovely. Just a tip in case you are short on time or patience like me. I didn't have any poppy seeds on hand so I subbed them with hemp hearts which adds a nice bit of complete protein and healthy fats, however my loaf is lacking those beautiful specks of black seeds. 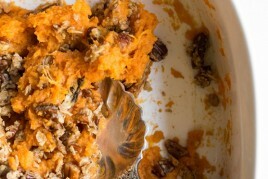 I imagine that you could change up the nuts and seeds as you see fit in this recipe. It's pretty versatile! Lastly, I used coconut sugar instead of Sucanat and I used thinly sliced almonds instead of whole almonds (so it would be easier to slice). I don't recommend skipping the toasting step - I tried this recipe both ways and taking the time to toast the nuts/seeds/oats in the beginning resulted in a more flavourful loaf. Preheat oven to 325F and grab an extra large baking sheet. Add the oats, sesame seeds, pepita seeds, almonds, and sunflower seeds onto baking sheet. Spread out evenly and toast in the oven for 7-10 minutes. Transfer to a large bowl. Add the remaining ingredients to the bowl and stir to combine. The dough will be very watery at first, but thanks to the psyllium husk powder and chia, it will thicken up quickly. After stirring, cover the bowl with a tea towel and let it sit for around an hour on the countertop. The dough will be very thick. Lightly grease a small loaf pan (9" x 5") and then line it with a piece of parchment paper so you can easily pull the loaf out. Scoop the dough into the loaf pan and press it down firmly and evenly. Bake the loaf at 325F for 30 minutes. Grab a baking sheet. Now remove the pan from the oven and carefully lift out the loaf. Carefully, flip the loaf upside down onto the baking sheet and bake it for another 45-50 minutes, uncovered, watching closely during the end of the bake time. The loaf will be lightly golden and firm when ready. Cool loaf completely on a cooling rack. Slice and enjoy! I love toasting this bread and spreading some coconut oil on top. It's just divine. Also try it with avocado and hummus, jam, or vegan butter. Notes: 1) Heather says you can use 1/4 cup psyllium husks instead of the 3 tablespoons psyllium husk powder. Where to find the psyllium husk powder? I've had success finding it in the vitamin/protein powder aisle of Whole Foods. 2) Do not skip the psyllium husk powder - it binds the loaf together. 3) Feel free to toss in finely chopped dried fruit like dried cranberries. I got word yesterday that The Oh She Glows Cookbook advanced to the semi-final round in the Goodreads Choice Awards! Thanks to those of you who voted last week! If you’d like to see the cookbook advance to the final round you can vote again in the Best Food & Cookbooks of 2014. This round of voting is open until November 15th. hugs! This definitely looks like birdseed bread, but I’m sure it’s delicious! I saw your book in Barnes and Noble weeks ago and spastically told my now-Husband, “I KNOW HER!” Like Buddy the Elf. He looked at me strange. hah…you are getting me excited to watch Elf this season! This looks absolutely DEVINE. My kind of bread. This sounds awesome! So excited to try it! Do you know the shelf life or best way to preserve part of the loaf? Freezing ok? Yes freezing works great! Just be sure to cool it completely first. I also store it in the fridge for up to 4 days or so. To give you an idea…..I made the original Life Changing Loaf of Bread twice for a friend. First loaf, she took on a two week road trip, in a cooler, from Vancouver to Whitehorse Yukon with a couple of stops on the way and it was fine when they dug into it once she reached her destination. The second trip, the same friend took a individually sliced and vacuum packed loaf of the same bread, when she walked the Camino (approx 500 miles/800 km) with no refrigeration, stored in her backpack. She ate a piece a day for almost 3 weeks before she had to throw the remainder out. Myself, I definitely would have done the cooler thing but I don’t think I would have carried the bread on the Camino. Just sayin’… When I make the bread for myself, I eat half, freeze half. I will be trying this version soon, I am intrigued with the addition of the chickpea flour. Congratulations on being in the semi-finals! I bought your cookbook during the summer and it has become my primary go-to. I love how creative your recipes are. You’ve inspired me to start doing some food blogging too, so thank you! :) I will be sure to vote for you. Oooh, this looks delish! I could even see cutting this smaller and using it for appetizers! Love that idea. I was also thinking it would be amazing cubed and toasted to use as croutons. I am trying out with breakfast this days and this looks just like something I would love with some chia jam and a hot chocolate cup. Same questions as Sara because i am pretty sure i will be the only one eating this kind of bread. What’s the best way to enjoy this bread longer ? it freezes well! I also store it in the fridge for up to 4 days. I love the texture of this bread!!! I would definitely give it a try! Oh my goodness, that is such an excellent idea!! The flax/seed breads have always been my favourites, so this looks right up my alley! I wrote my email in the link above ^ instead of my blog, so perhaps delete that comment? I am always looking for delicious new breads to try and I LOVE how healthy this looks! 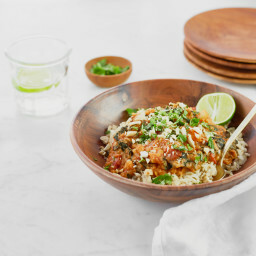 I will definitely be making this, and checking out her gorgeous cookbook! I need to get my hands on that cookbook and some psyllium husk powder to make this yummy bread! It sounds so hearty and delicious! I think I’d love it warm with some almond butter on top! Yumm!!! This bread looks amazing! I’ve seen a few of the recipes from this book on blogs lately and I can’t wait to get my hands on it! Wowza, that bread looks good. Perhaps I am some kind of sub-human monster, but I have come to dislike bread…even the gluten-free and sprouted versions. The photos of this bread, however, made my mouth water. I will definitely be giving it a shot; who knows, maybe it will change my mind. Just wondering, did you toast your hemp seeds before mixing them in, and if I use poppy seeds, ought I to toast them, or no? Or is this a personal preference sort of thing? I love that this is LOADED with all kinds of goodness! This looks so earthy and delicious! I’m a huge fan of these seedy loaves, so I bet I’ll love this! Thanks for sharing another version of a favorite! I’m going back to grain-free eating and oatmeal is a no no besides it rips my stomach apart :( and this looks absolutely wonderful! Any substitute for oatmeal possibly? If not, I guess I’ll go back to drooling over the pictures! haha….Thanks! I have used rolled quinoa instead and it was really delicious! Hi, this looks great! Can I use a substitute for psyllium husk? Is it necessary? Hello, I’m just wondering where you get your certified gluten free rolled oats? I went into Community Natural Foods and they told me that you can’t get certified gluten free oats in Canada, only wheat free. Have you found them somewhere else? Thanks for your time! You can buy them online. I like vitacost.com. Their prices are good and they have a bunch of other vegan products, including psyllium husk powder. Haven’t tried this bread yet but I need to asap! what a fabulous recipe, the exact sort of thing I like when I don’t want to eat regular kind of bread but still want some bready-seedy! Great recipe! I made it today and it turned out perfectly but I needed to use 4 cups of water. I started out using 2 cups, according to the recipe, but it didn’t seem to be enough to moisten all the ingredients. I love your website and cookbook. Good luck on the Goodreads Choice Award. Oh my that looks delicious! So nutrient packed and I am sure it would be fantastic with jam. 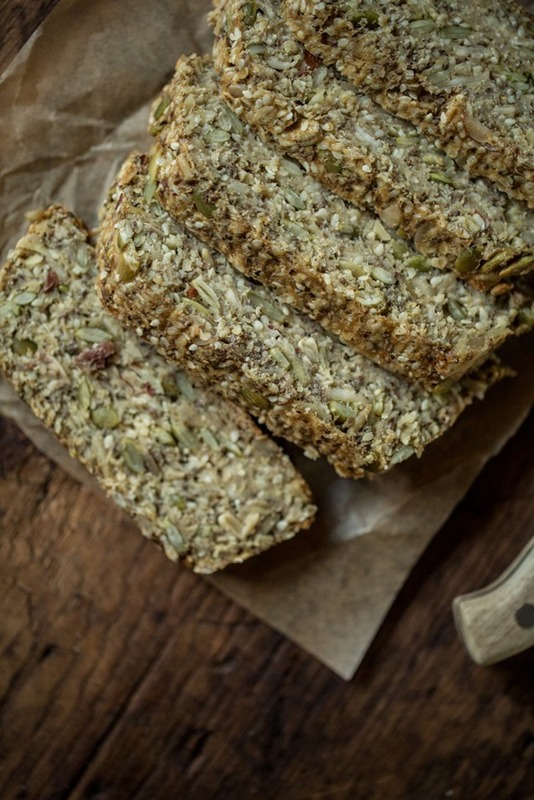 Such a delicious bread…something I’ll certainly try out on my toddler..so many nutrients! That looks incredible. My favorite breads have always been the seedy chewy ones, so this is right up my alley. I am allergic to chickpeas though! What flours are similar to it that I might try to sub? I find that almond flour almost always works as a sub in gluten free baking. I might try that! Hi Michelle ~ Did you end up using almond flour? Did it work??? I was going to ask the same question. I have almond flour at home that I would rather use. Would love to hear how it came out for you! I have a completely non-recipe related question (although the recipe looks delicious)! May I ask where you bought your cookbook holder? I am in the market for one and I love the design of yours! Mmmmm I made this last night and it was delicious! I love that this bread actually has nutritional value. Thanks for another great recipe! Oh my goodness this is perfect. I’ve seen her cookbook pop up in the blog world just about everywhere and I can’t wait to get my hands on one. Pinning this recipe! I love the Life Changing Loaf! Somehow I had never even heard of Heather’s blog before… but I think I might be needing this book. Oo this book looks awesome! I swear Ive made this loaf before. I originally found it on the blog My New Roots. I believe the loaf was called The Life Changing Loaf of Bread. Anyway there were roasted hazelnuts in it and it was amazing! I still have quite a bit of psyllium husk left over so Ill be sure to try this loaf! Thanks again for the great post and recipe!! looks really yummy!! 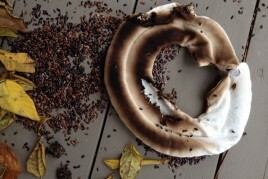 I love seedy bread! Wow. Normally I avoid bread like the plague but this, this is a loaf I can seriously get behind, into, onto whatever…Can’t you just go ahead and mail me a loaf! This looks fabulous! Am going to make this week but have a couple of quick questions… are all seeds in the recipe raw (not toasted or roasted)? And, if I want to use poppy seeds instead of hemp hearts, is the conversion 1-to-1 (a quarter cup of poppy seeds)? Thanks for the great recipe! I used raw seeds/nut and then toasted them as per the instructions in step 1. I think the original recipe used 1/2 cup poppy seeds, but 1/4 cup would work too. Hope this helps! This looks wonderful, and I plan on making it. I have a big bag of flaxmeal here, and wondered if I could substitute the psyllium husks with the flaxmeal. I often make flaxmeal bread and it binds together well. Did you make the bread with flax meal instead of psyllium? I’m wanting to try this as well. No, I haven’t been able to make the bread yet. I did an online search for psylium husk replacement in baking, and some have reported success with a flaxmeal replacement. You may need to ‘ play ‘ around with the recipe a little. Good luck, and if anyone else has suggestions they will be greatly received. I made this bread last night, and it was so delicious. I’m not gluten free, so I make lots of wheat bread, and thus was way tastier than most breads I’ve ever made. woa, that bread is seriously nutty! I think I need to make this! What a gorgeous loaf of bread! Wow! I could see using this as a crostini for holiday appetizers! It will also be the perfect hostess gift as we visit friends/family over the new two months! Thanks for sharing! oh my gosh looks incredible. and healthy! Woah! This is some loaf! Kinda intense looking, but in a good way. This would be a great recipe for the household. We have a fair amount of gluten-less people who love a hearty slice of anything warm with coconut oil. Thanks for sharing your sneak peak! I made this yesterday and it was amazing and it’s even better today. My partner loved it too. I did have to bake it extra long, like 70 minutes I’m guessing because I live at a higher altitude. I wonder if it could be baked at s higher temperature. I’ll try that next time. Angela, thanks for posting this. And I’m loving your cookbook! [ Smiles ] I have never had toasted super-seed, power-bread before. flax seeds flax seeds are less expensive would they work? I tried this recipe, and it rocks! Your substitutions worked beautifully. I love the fact that you only have to wait one hour before baking it. I wonder what difference leaving it overnight makes? I added a handful of raisins and a good shake of cinnamon. What a beautiful bread. I made this bread the other day, it is so so yummy, I will be definitely be making it again. Thanks Heather :) I love your blog. How amazing can it look…I can fell the taste only by looking at your photos. Congratulations! I will try it for sure, as it goes perfectly with my new hummus obsession. I’m not sure if someone already posted the answer to this. I know before I made the bread I had looked to see if anyone had subbed ground flaxseed in for the psyllium husk powder. I found the powder at Whole Foods, but the quantity in which they sold it (for me) was just too much for one recipe (I’ve never had the need for it before). What I did was just use 3 tablespoons of ground flax instead of the powder and voila! The loaf turned out fantastic!!!! 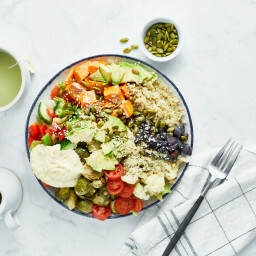 This is so delicious and so healthy! We’re taking it on our holiday road trip. Can’t wait!! My thanks to the above poster who answered the question about being able to sub flax seed meal for the psyllium husk powder. Because of that comment, I was able to make this recipe yesterday. We all loved it! (And, I was thrilled that my loaf looked just like the pictures!) This recipe is a “keeper”! This looks amazing! My mom makes a cookie that we call “the bird seed cookies”, despite their real name. Im adding these to ingredients to my shopping list today. FYI made the quinoa cakes and they were quite tasty too. Way to go on your precious baby girl! One word – DELICIOUS. I ran out of time so instead of a loaf, I made 20 biscuits. (Used a large cookie scoop, then flattened the dough, put them on silpat lined baking sheet) Baked them for 20 minutes, flipped and baked an additional 30. I absolutely love the chewiness and the texture and the flavor. 5 star recipe! Hey Angela! Do you think I can use ground flax instead of the psyllium husks? I’m super allergic to those guys! Thanks for everything you do!!! Tried this, and was amazed at how incredibly easy it was. Very tasty too! Thank you so much for sharing. What a lovely bread! I used black sesame seeds which resulted in a fabulously speckled loaf of bread, served it as an entrée with lentil soup at a dinner party and it was loved by all. Most definitely a staple in my diet from now own! I changed the nut and oat for buckwheat, millet and flaxseed. I soaked the seeds (but not chia and flax) overnight before drying and roasting in the oven. Turned out very well. It’s a dense and very filling bread, but it’s perfect to pair a squash soup! Whoa! This bread looks totally awesome. I don’t eat oats, and I do eat everything else. Can I make the bread without the oats? The psyllium husk powder caught my attention. I have only used it to cleanse my digestive system, and not to cook with. This bread is very good. Easy to make, filling and delicious. I will definitely be making it again… especially when planning menus for kayak trips or camping. This bread is delicious! Easy to make and really tasty. I will certainly make it again when planning menus for kayak trips and camping. I am 15 weeks and 4 days pregnant today and food hasn’t sounded or tasted good in about 2 1/2 months; however, I still visit your blog a few times a week and I’ve asked for your cookbook for Christmas. I hope I get it! Thank you for sharing your delightful stories and your marvelous recipes! At this phase in my life, I truly appreciate your baby story. It gives me encouragement to go through labor without medication which is what I want. I just hope my appetite comes back before baby is born as does my husband because he misses my cooking :). And I miss trying your new posts. Thanks again for your blog and Merry Christmas! the loaf pan before putting in mixture so that when the loaf was turned over it showed. it does not take much moisture this bread is not dry or heavy it is wonderfully designed loaf of bread. Thank you for your generosity in sharing this divine bread with us I will purchase your book for sure. I have made this 3 times now and I absolutely love it! One thing I have noticed is it seems like it is a bit “doughy” in the center, even after baking it the full time or longer, but stick it in the toaster oven before eating and put some almond butter on it…..yummy! Hi Angela. Having a hard time finding chickpea flour, do you think my coconut flour would work or are they too different? I just LOVE LOVE LOVE this stuff! Found your recipe about 2 weeks ago and have made this bread at least 4 times now. Even my picky teenage daughter loves it (and that’s really saying something!). Recently modified to make it cinnamon/raisin bread by adding 1/4 cup raisins and 2 tsp cinnamon to batter. So dee-lish! THIS RECIPE IS NOT GLUTEN FREE!! Although it does look absolutely delicious, I do have to point out that there is no such thing as ‘certifiable GF oats’. Oats are NOT gluten free. Yes, you can buy oats that guarantee no cross-contamination with gluten containing cereals, and these are okay for those who are simply gluten intolerant but NOT for coeliacs. I was really disappointed seeing the ‘GF’ tagline in the title of this recipe, only to discover that the recipe is in fact not GF at all :(. I’m a seasoned coeliac, so I know that oats are a no no, but for newbies or people cooking for coeliacs these kinds of recipes, and throwing around ‘GF’ like a trendy tagline are really confusing, not to mention dangerous!!! Following a strict gluten free diet is the only way to manage coeliac disease, which is very serious when not managed correctly. Imagine if someone made and offered this bread to me assuring me it was GF!? Yes, I am responsible for what I eat, but there needs to be a wider understanding and consideration towards gluten free foods and what gluten free actually even means. Because of the lack of understanding, if someone offered me this bread I would most likely refuse, because honestly I’d rather be safe than sorry. Do you know how much I’d like to be able to say yes and to have trust!? I’d love a wider understanding of what gluten free really means, and I’d like to see the end of ‘gluten free’ being used so damn flippantly, and reserved for foods and recipes that are actually 100% gluten free, no questions asked. I feel that using the GF tagline in the way that you have here discredits the term ‘gluten free’ and makes it extremely difficult for those like myself. Lets move towards people taking coeliac disease and the need for gluten free foods as seriously as they should!!! :) I love your blog and I’m not going to slander it or stop reading, but I think you could/should be better informed about gluten free foods before throwing the term around and using it as an incorrect, misinforming tagline. This is just a topic very near and dear to me so I hope I haven’t offended you in any way. Thanks ! I buy Bob’s Gluten Free oats. It says gluten free on the bag. Is it not? I’m sorry I am not sure as I haven’t tried it any other way. I think a couple readers have commented with subs, so I would scan them to see if anyone tried anything successfully. Good luck! Can i replace the chickpea flower for a different type of flour like almond? I was interested in the recipe for Heather’s Toasted Super Seed Power Bread but immediately disappointed to read, in the recipe – “1 cup rolled oats (use certified gluten-free if necessary)”. Unfortunately, as an incredibly sensitive coeliac I cannot tolerate oats – even the certified gluten-free variety. Is there an ingredient that can be used in its place? Everytime I bake any type of bread and even this nut/seed one, it does not cook the middle and ends up being too moist in the center. Any help? I am so glad I have come across so many great recipes over the past little while….I am excited to try this nut bread. I too am wondering if any one would have any ideas of something besides oats to add when i make this. Thanks so much for all the neat ideas to sub different ingredients to never make this a boring bread, for sure. look forward to making this soon. Can I substitude the oats ?? how is this bread in a toaster after it is made? will it hold up okay in the toaster? Ok at long last I made the bread……..a little darkish like pumpernickel bread (mught be a liberal hand with chia seeds ?) but cooking times were on target and kept close watch in the last ten minutes of baking. My loaf looks a little like meatloaf ……a sad little meatloaf…..lol…….but I have half in freezer andf half in fridge to toast up and try. It’s in the oven, fingers crossed very hard, added black currents which should be delicious. with the extra ingredients I made a similar concoction, added extra coconut sugar, baking cocoa and some raw rice protein in an attempt to make protein bars, I’ll share results shortly! Just wondering. If you had to choose between making this loaf and making the “life changing” loaf based on taste/texture alone, which one would you pick? Trying to convince my hubby to try it, and want to make sure I’m making the one with the best chances. The first recipe I have tried from this site and it is flipping awesome. So awesome, in fact, that we’ve made it twice a week since the beginning of this year. Even my bake shy BF loves making it and experimenting with the ingredients. We do a lot of sport and it’s a perfect grab and go breakfast. Great on hikes, a perfect snack. Also satisfying when you have a sweet tooth. Only one note, if you can’t find chia seed hearts, definitely go for poppy seeds rather than whole hemp seeds, unless you want to crack your jaw. This was delicious. Cooked through nicely and was dense and chewy in a good way. I substituted freshly ground flax seed for the psyllium husk powder. I added 1/4 cup of rice flour, 1/4 cup spelt flour, and 1/2 tsp baking powder. I used 2 cups boiling water and let the batter sit only 10 – 15 minutes. It thickened up nicely. I cooked for 30 minutes at 325 as directed, then 30 more minutes on the baking sheet at 350. It was perfect! can i use rice flour or another flour in place of the chickpea flour? So happy you found this recipe, Asako! Hi! I’ve been looking to make something like this for weeks now. I’m going to make it today – however hemp seeds are hard to come by in NZ. Any suggestions for a substitute? Thanks! I made this recipe when you first posted it and absolutely loved it! I just made it again today, and accidentally left out the chickpea flour. I only realized halfway through baking lol. Once baked the loaf held really well. I haven’t cut through it yet but I hoping it slices well. I will update this soon for those that can’t find chickpea flour. The bread sliced beautifully and held together really well. It was a bit wet because I forgot the chickpea flour so I put the slices in the oven at 300 degrees and baked it on each side for 10-5 min. Thanks so much for sharing, Tiffany!! Did you find that the extra time in the oven helped?